Macy is an English Labrador retriever, which are a bit bigger and brawnier than their American counterparts. MESA – Mesa police have adopted their first therapy dog, primarily to provide smiles and comfort to those who have been traumatized by crime. 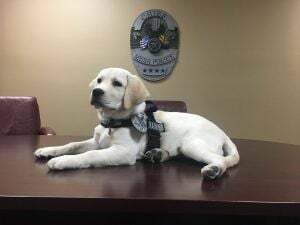 Macy, a 16-week-old English Labrador puppy, will be trained to work in the special victims unit as a therapy dog for children and adults. “What we’re hoping is that down the road, when she’s certified, that she’ll be able to help with reluctant victims, maybe children who are not comfortable talking about what happened to them, even adults who are very upset or distraught about what happened,” said Mesa police detective Chelsie Furman, who will train Macy. Dogs have a way of bringing those things out of people, making it easier to talk through difficult experiences. Macy won’t be able to interact with victims until she’s certified, but her trainer says the pooch is right on track. Although Macy can’t work with crime victims yet, Furman says she helped comfort some officers who have lost family members. Just having a puppy in the office lifts of the spirits of everyone, she said. Therapy dogs provide scientifically proven benefits for victims. They are said to help with depression and anxiety, reduce blood pressure and promote communication, according to PAWS for people, a nonprofit organization specializing in therapy dogs. The department says Macy will be certified in therapy as well as emotional support. “Talk to a dog for a minute. Forget about the trouble of everyday life for a moment.” Furman said. Slug: BC-CNS-Therapy Dog. 310 words.